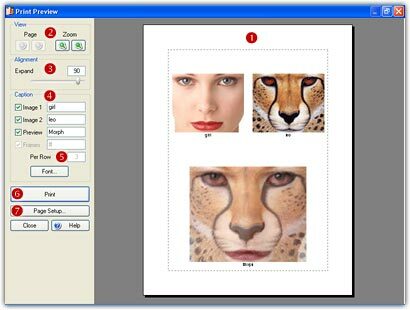 With FantaMorph, you can directly print source images, preview frame or even all morphing frames, without having to go to any additional software. When you working on any view mode, choose the File/Page Setup menu to select paper size and orientation, adjust margins, etc. Choose the File/Print menu to start printing. The 4 view modes can be printed as shown below from left to right: Full View, Edit Only, Preview Only, Frame Sequence. FantaMorph supports what-you-see-is-what-you-get (WYSIWYG) print preview, so you can choose the File/Print Preview menu before print. 1. Preview Page ( ) will be displayed on the center of the preview window. The margins of the page will be presented as dotted lines. 2. Adjust view ( ). If the total pages is more than one, you can use the two buttons under Page to select a page to preview. You can use the two buttons under Zoom to zoom in/out the preview. 3. Adjust size ( ). You can use the two buttons under Expand to make the objects larger or smaller, in other words, make the space between objects fewer or more. 4. Add captions ( ). You can type any text after Image 1, Image 2, Preview, Frames as the captions for source images, preview, and frame sequence separately. Please note that you should use the special symbol "#" to mark the frame number for printing the frame sequence. Click the Font button to set the font style, size, color, etc. 5. Adjust frames per row ( ). For printing the frame sequence, you can set the number of frames per row. Printing more frames in one row will result in smaller frames and fewer pages printed. 6. If the preview is satisfied, click the Print button ( ) to start printing. 7. Click the Page Setup button ( ) to select paper size and orientation, adjust margins, etc. The preview will be automatically rearranged after page setup.